sometimes i find finding the right foundation really tricky and i had serious trouble in my early teenage years to find a foundation or even a tinted moisturizer that suited my skin tone because i didn’t want to look like a weirdo with a foundation being to dark or having the wrong undertones but now that i’m older and basically love everything beauty i found myself three awesome foundations that i always go back to and that i just love and use all the time and i felt like sharing them with you and probably make your foundation hunt a bit easier. there are quite alot of foundations that i want to try at some point next year but these ones just work for me. the first one i actually quite new to my collection but i just fell in love with it. when i’m at uni and have to get up quite early, i just a need a light foundations thats super easy to blend and that just makes my skin look a million times better. its very light and very runny sometimes but i only use i tiny amount and it actually has great coverage without being to heavy or cakey or odd looking. it lets the skin look like skin but better. almost no pores and really glowy. this is the perfect foundation when you’re looking for something light and easy. my perfect early uni day foundation. this is my favourite since the beginning of the year. the wake me up foundation by rimmel is just the foundation that everyone and their mother raved about and after hearing everyone loving it, i had to give it a go. because theres no rimmel in germany i always had to order it and i’ve bought three bottles of it when i was in denmark last summer. 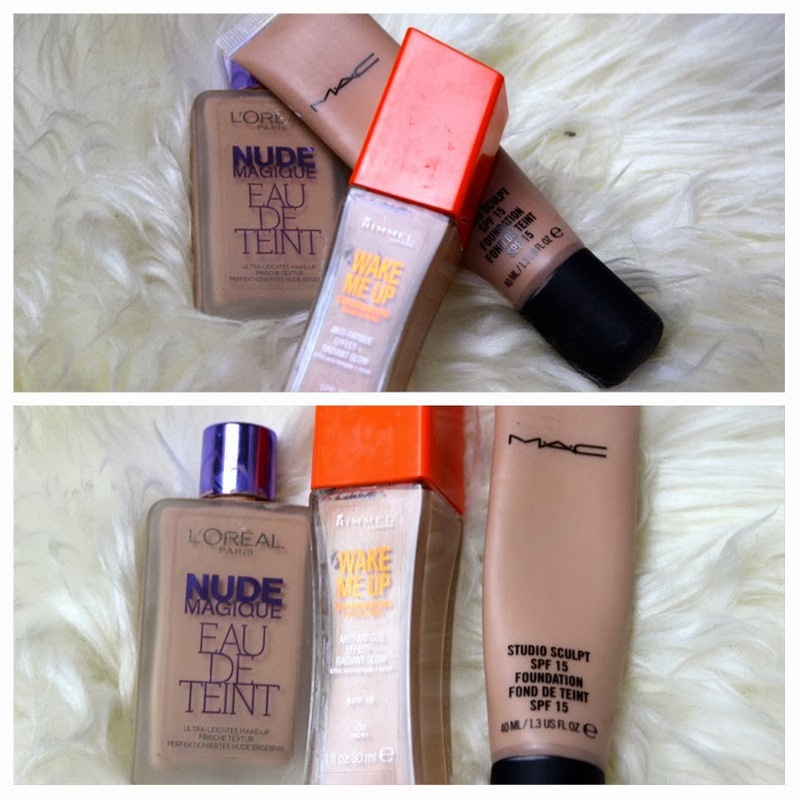 this foundation is medium coverage but buildable to even more. at the same time it doesn’t make the skin look cakey, just dewy and glowy and just gives it some kind of radiance which i love. again, i only need a tiny amount. i just makes me look awake and glowy. its the perfect foundation for me and i bet alot of you like it too. so this was the first highend and mac foundation i’ve ever tried and it is my favourite for a really long time and probably my third tube. its the mac studio sculpt which is almost a full coverage foundation but without a kinda mask effect. i only need a pea sized amount of it and it covers my whole face. eventhough it is a full coverage foundation it still makes you skin look like skin and just adds such a natural healthy glow. this is quite heavy but this makes my skin look beyond flawless and i just love to use it when i’m out at night or when i do a more glam make up. its just my favourite and i know that its not cheap but for me its worth every cent. mac also has the exact match to my skintone. i’m a nw20 and it just looks awesome. i hope you enjoyed my top three foundations. have you tried any of them and whats your favourite? i really want to try more such as nars sheer glow. thats on top of my wishlist. some more exciting news. my blog turned 1!!! i can not believe that i’m blogging for a year now and i love it more everyday. i hope we’ll celebrate more blog brithdays together. thank you guys so much for your support throughout the year. i love you lots. "New Years Eve Make Up"